My favorite financial journalist is Brett Arends, a regular contributor to The Wall Street Journal and MarketWatch. He’s one of the very few who doesn’t have his head up his you-know-what. Anyhow, Brett just published a tongue-in-cheek article about all the reasons the stock market is just going to keep going up and up. And I strongly encourage you to read it here. Yes, stocks look expensive compared with annual sales, net asset values, gross domestic product, the replacement cost of company assets, and the average earnings of the past 10 years. But none of that matters because valuation measures are completely irrelevant. The S&P 500 is almost three times as high today as it was in 2009. Therefore it must be three times as good a deal! People who aren’t bullish are losers and sissies. Everybody on Wall Street says this is a great time to buy stocks, and if they don’t know, who does? Mom and Pop are back in the stock market, and millions of ordinary investors can’t be wrong. People who know nothing whatsoever about stocks are starting to hand out stock tips again—and if that isn’t good news, I don’t know what is. I can think of several other reasons you should be afraid (very afraid!) 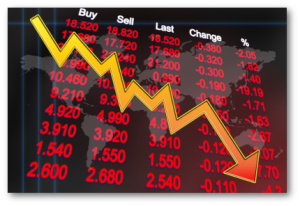 of a stock market crash that I’ll cover in an upcoming post. So, what do you think, are we on the verge of reaching new market highs? Or do you see a market crash coming soon? Let us know by leaving a comment below. TIRED OF HOPE-AND-PRAY RETIREMENT PLANNING? If you’re ready to stop worrying and wondering about when the next market crash will devastate your life’s savings again, and you’re tired of the “hope and pray” method of retirement planning, there IS a solution: Bank On Yourself. No two Bank On Yourself plans are alike. Yours would be custom tailored to your unique short-term and long-term goals and dreams. But unlike traditional investing strategies, you can actually know the bottom-line guaranteed amount you’ll have in your plan at every point along the way – before you decide if you want to move forward with Bank On Yourself. To find out what your numbers and results could be if you added Bank On Yourself to your financial plan, take the first step today by requesting a FREE Analysis, if you haven’t already.